Very frustrating because I am now in a different city! Especially because I tested it before and it did work. I use Skitch and Evernote daily across multiple devices. I started seeing this issue on iOS devices on 11/3. Sometimes images will upload, but most of the time they will not. Android devices are unaffected. I'm new with Skitch and i have the same problem. The only use avaiñable on my iPad is to copy to the clipboard and paste on the new note. I had the same issue starting on ~4 Nov too. Still continuing. 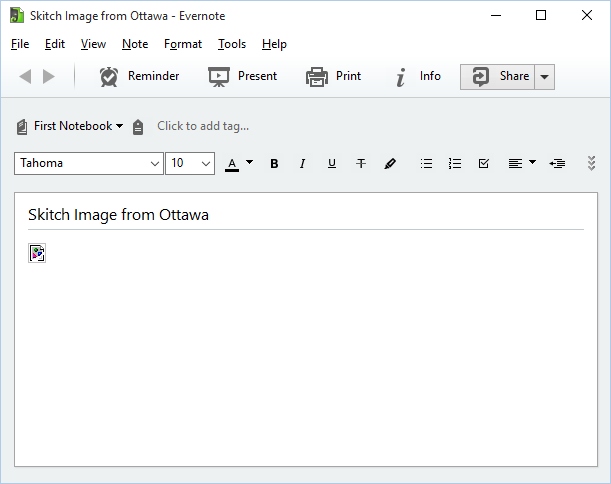 Skitch will say saved to evernote, a note will appear with the correct time stamp but there will not be any image. The Skitch/Evernote feature is one of the best! It had worked so well, that it became a key tool of my digital life. I am a little disapointed that we have not seen anything from support, even a we are working on it. Note I have found a work around, the skitch image is saved to photo, and you can up load it there but pay a big penalty in image quality. This is what I've been doing as well. It's interesting that the image shows up in Evernote after saving any changes you made to it, but it won't save if you upload directly to it. The lack of a response is to this issue is sad. I'm seeing a similar issue, but no note is being created at all. I used to use this all the time to transfer screen caps from iOS device testing to my evernote account. Now I'm getting the "Saved to Evernote" message but no notes are being created, either on mobile or synced to my account. Thanks for bringing this issue to our attention. I've gone ahead and converted your posts into support tickets and a support representative should respond with assistance shortly. Hi - any update on the issue? in addition to the picture missing, I realized that it is being saved in the wrong Notebook. I selected "Notebook A" in Skitch, but it's selected in "Notebook B"
thanx for a solution. Can you please also provide a timeline of solution to above? What's your ticket number? I can look up the status with our support team. Thanks! A support representative has responded to your ticket. Let me know if you didn't receive an email. Has anyone heard back regarding their tickets? I got a response back in December and submitted the the logs they requested, but I have yet to hear any updates. I am at the same spot where I submitted logs. That was today. I still have to get a reply. Guess this won't ever be fixed. Our office was closed yesterday for a U.S. holiday, however one of our support representatives logged on to respond to your latest message. If you're not receiving the messages, please let me know. Not receiving a response since December doesn't seem right. What's your ticket number? I'm happy to look into what happened. But based on the article I posted above (and an old e-mail I stumbled upon), Skitch is being dropped so I take it that's why no one has received a response. We're still supporting Skitch for Mac and iOS devices, and it looks like you're on an iPhone :-). Our sincerest apologies for not responding. There was a human error and we didn't mark the ticket appropriately and will take this as a learning opportunity. The support representative that was assisting you will respond today. Thank you for understanding! We responded to your request on December 8th. Did you not receive it? Please check your spam inbox. We'll go ahead and resend the response. did everyone else's issues get resolved? what did you have to do? in the meantime, i've filed a ticket and am waiting on a response. 5 months later and the issue is still occurring. Yay. The worst part of this is that when it started happening, I was using the free plan and, even though images failed to show up in Evernote, they'd still count against my monthly storage quota. 7 months later and the bug remains. Just don't ask me to create another support ticket, enough people already reported this issue and you didn't fix it. how much time yet or how many tickets describing the same bug you need to finally fix it??? Well, there goes Skitch app!! Time to move on. Thanks a lot Evernote! As a workaround to this problem, you can simply send your Skitch content to your Evernote email address. In Windows, just go to Tools > Account Info to find out what it is (or in iOS, Account > Settings > Evernote Email Address). Then in Skitch say you want to email the content instead of sending it directly to Evernote. I used to use Skitch alot but I had not used it for about a year. I needed it again today, so I downloaded from cloud in app store, took and annotated lots of photos, assuming it was doing what it claims to do. Over half of the Evernote notes had no image. It was not saving, so I tried emailing to myself at GMail. Nothing. I was about to drive 40 minutes to a furniture store. I am glad I checked. Is this going to be fixed, or should we all just find alternatives? I have been an Evernote subscriber for well over 10 years, but I keep having to find alternatives. You still don't have outlines, so I use Workflowy. You don't have easy formatting, so I use Quiver. What is Evernote's strategy in silently allowing Skitch to die?